Obtains parameters of the requested volume fading that will be applied to the given sound file item when it will be merged into the session's stream. 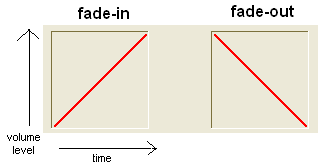 A specific volume fading can be predisposed through the SoundComposer.ItemSoundFileVolumeFadingSet method. The unique identifier of the sound file item previously returned by the call to one of the following methods: SoundComposer.ItemSoundFileAdd, SoundComposer.ItemSoundFileMemoryAdd, SoundComposer.ItemSoundFileRawAdd, SoundComposer.ItemSoundFileMemoryRawAdd, SoundComposer.ItemSoundFileFromEditorAdd,or SoundComposer.ItemSoundFileFromRecorderAdd. 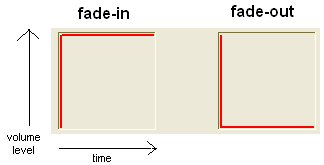 Boolean value specifying if the fading is a fade-in or a fade-out. 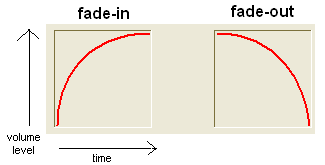 Reference that, on return from the method call, will contain the type of curve applied to perform the volume fading. 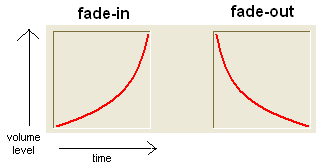 No curve is applied: volume will be changed immediately and will be kept till next volume point. 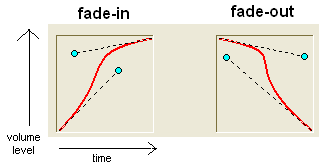 The custom curve designer manages a windowed control, whose visual aspect can be defined programmatically, which allows designing volume curves based upon Bézier curves whose shape is defined through the manual positioning of 2 control points (displayed in cyan color on the graphic below). 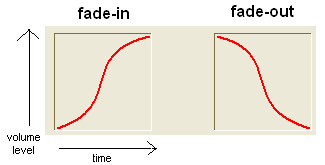 For further information about the use of the embedded CurveDesigner refer to the tutorial How to create custom volume curves. 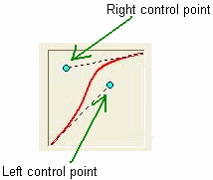 Reference that, on return from the method call, will contain the horizontal position, expressed in percentage, of the left control point of the Bézier curve. This parameter is ignored when the nCurveType parameter is set to a value different from VOLUME_CURVE_CUSTOM. Reference that, on return from the method call, will contain the vertical position, expressed in percentage, of the left control point of the Bézier curve. Reference that, on return from the method call, will contain the horizontal position, expressed in percentage, of the right control point of the Bézier curve. Reference that, on return from the method call, will contain the vertical position, expressed in percentage, of the right control point of the Bézier curve.